What if that thing you really feared happened? Would the joy you hold pop? Or would you experience love and joy deeper than you can imagine? They met in college and fell in love. They talked about getting married, and he started looking for a ring. They dreamed about life together, a life of beauty and joy, raising babies and laughing with friends and growing old. They did not imagine a car accident. They did not imagine his brain injury. They did not dream about the need for constant care and a wheelchair and fear that food might choke him. And they could not have imagined how persistent love would be. Theirs and God's. 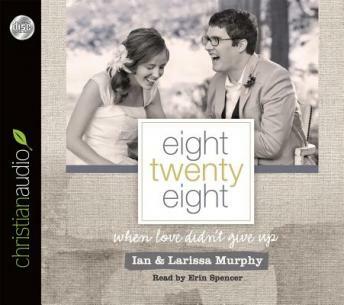 Ian and Larissa Murphy tell their story of love in Eight Twenty Eight. Except, it's not just their love story. Really, it's yours as well. Read and gain a picture of love that will challenge all you think you know about what is true and what persists.